In the second part of the talk given in Insabina last year and at the Yoga Space Leeds in February (first part here) I described the characteristics of so-called Mysore practice, and the rationale behind it and behind the firm and physical style of adjusting often experienced as part of such a practice. I’ll summarize what I said here. Mysore practice refers to the ‘self-practice’ approach to Ashtanga yoga in which the practitioner goes through the sequence at her or his own pace with minimal intervention from the teacher while the other students themselves go through their own practice at their own pace. Here’s a clip of a morning Mysore class in the Yoga Space, with Joey teaching handstand to a student at the front and everyone else getting on with it around the room. The term Mysore itself derives from the city in Karnataka, South India, from which Ashtanga derives, and where the late K. Pattabhi Jois (the developer and codifier of the Ashtanga system) maintained his yoga shala (school) known as the Ashtanga Yoga Research Institute (AYRI), since inherited by his grandson Sharath. 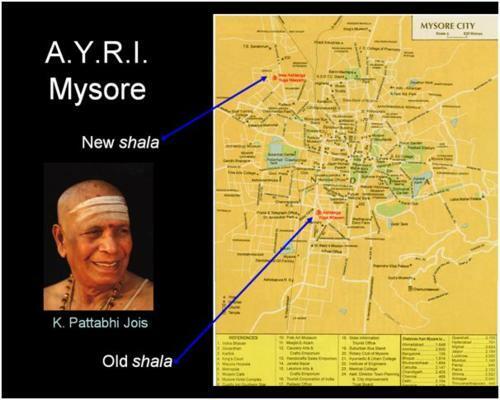 In the next post I will post a clip of the morning chant and practice at the AYRI, but here’s a map of Mysore and the locations of the old and new shalas – the big new Twenty-First Century one located in an affluent suburb of the town. To repeat then, learning Ashtanga the ‘Mysore’ or ‘self-practice’ means studying with a teacher but, instead of following a class with everyone doing the same thing, the student will practice at her or his own pace, according to his or her own breath. The teacher will add a new posture when adequate ability is demonstrated in the previous posture. A beginner might find himself doing a short practice of, say, the two sun salutations and a few standing postures followed by some cross-legged sitting and rest; next to him might be an advanced yogini adding third series postures, under the instruction of the teacher, to her second series practice. But the intensity and internal quality of the practice could be comparable in both cases, and the practice equally challenging and rewarding for each. My own experience is that progress is faster when you study Ashtanga the Mysore way. Mysore encourages you to take responsibility for your own practice and to become very aware of your breath and body. You internalize the practice by committing it to somatic memory, and you build a sense of the practice coming from you, from within, rather than being imposed from without. There’s much more to say, but a few other points should definitely be mentioned. Firstly, it’s worth knowing that it’s not considered auspicious to teach a new posture to a student on a Tuesday. Secondly, the traditional idea is to practice every day except Saturday; if you do so, you will certainly appreciate the days off for New Moon and Full Moon days (as discussed in a previous post). Finally, bear in mind that there’s a certain etiquette to be followed in order to practice any series but primary in a shala where you’re not known. You should certainly ask the teacher first, but many shalas will insist that you only do primary on the first day there in any case. An experienced teacher will recognize from your primary practice whether you are capable of, and used to, going beyond it. A characteristic feature of the Ashtanga/Mysore approach to the study of asana is the physicality and (often) strength of the ‘adjustments’ performed by the teacher. What is an adjustment? Well, it is a correction or aid to posture that can take at least the following forms: verbal instruction (“turn your back foot in a little”); correction through touch (the teacher physically moves the student’s back foot in a little); physical help in performing a challenging posture (e.g., the teacher acts as ‘post’ to help with balance in Uttitha Hasta Padangustasana, which is part of what Joey is doing in the pictures above); and the application of force to increase flexibility (this can be gentle or powerful – or, perhaps ideally, both; Joey is also doing this above). Watch Norman Allen, in the clip below, one of Pattabhi Jois’ earliest Western students, employ all of these techniques to help a student in Marichyasana C, from the film Enlighten Up! (dir. Kate Churchill, 2008). What I really enjoy about this clip is the sense of tough love you get from Norman in the down and dirty encounter of teacher and student. No two students are alike of course, and nor are any two teachers. This means that there is no such thing as an ideal adjustment that will not itself be adapted according to the relationship of size and disposition between teacher and student. 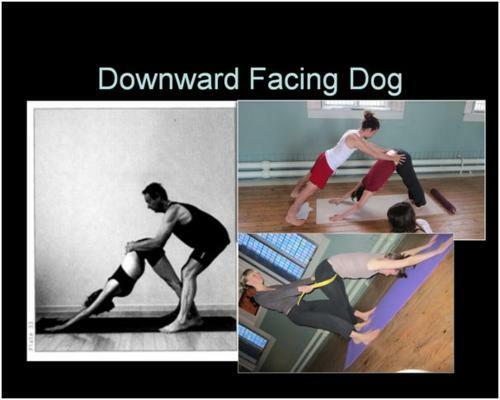 This is clear in the examples below, where three students with three very different teachers (Brian Cooper, Joey and Nichi) experience three varieties of adjustment to downward dog. Different teachers have different styles and even different philosophies of adjusting. Some teachers believe that no discomfort should be felt by the student; I guess the problem with this is that degrees of ‘comfort’ will always be experienced dissimilarly by individuals, and the same touch might be perceived as soft or strong depending on the person receiving it. But how can I tell if what I am feeling is creative discomfort or unnecessary pain? Good question! As suggested above, the perception of discomfort or pain is personal and subjective. It is affected by one’s age, one's own personal history of illness and injury, and one’s life experience (of giving birth, for example). Anyone who’s ever had a knee injury will be acutely sensitive to being manipulated in Marichyasana D. Too sensitive sometimes? Maybe not: we’ve all heard the horror stories of the clumsy adjustment that keeps you off the mat for months afterwards. But an experienced teacher can often sense what your body is ready for before you can. Conversely, your own experience in the practice will teach you how to relax into the unfamiliar and the intense, and teach you that they are nothing to fear; your experience will help you to develop an awareness of your own capacities and of that crucial difference between pain and creative discomfort. The best way to develop such an awareness? Mysore practice! The internal quality of self-practice encourages self-awareness… You get to know yourself, and in a sense to become your own best teacher. Being adjusted can be an intimate experience, and can be quite a shock to the student new to the practice, who may have only previously been touched in such a way by a doctor or a lover. The student has to feel that the intimacy of this touch is not intrusive, and has to trust the teacher’s ability and integrity. A teacher earns your trust though her or his competence and employment of ahimsa (non-violence). But it is important to realize that the student has a responsibility in receiving an adjustment. It is vital to work with the teacher when she or he is performing an adjustment on you. This means, above all, maintaining the breath, and using it to lead you calmly into the zone of creative discomfort. The process might be described as a kind of confident surrender. A lack of trust or cooperation between teacher and student, which often manifests itself as resistance on the part of the latter, can lead to injury – for teacher as well as student. In the last part of the talk I discussed the origins of Ashtanga Vinyasa yoga and the controversial question of its antiquity, as well as its relationship with certain other forms of modern yoga. I will summarize this material in my next post.